"The symbol for a signal was inadvertently left off of the preliminary plans mapping presented at the public meetings. 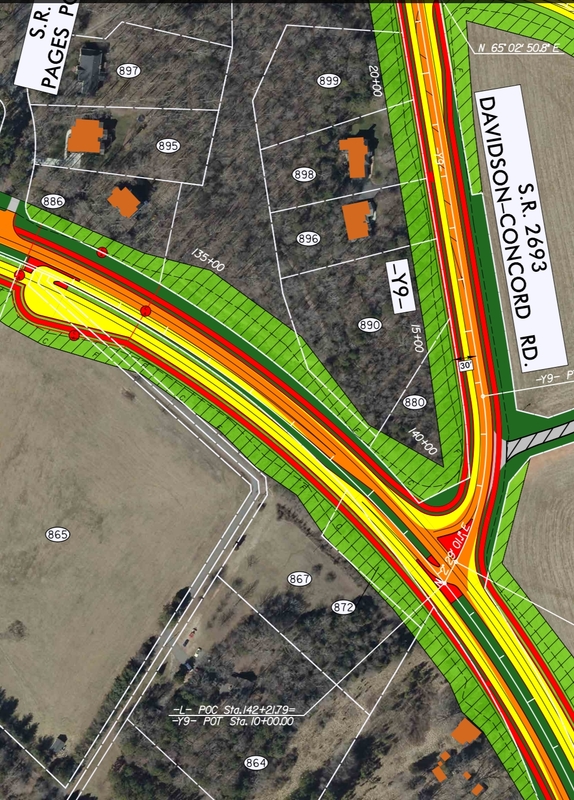 Currently, a signal is proposed at the intersection of Davidson Concord Road and NC 73. I apologize for any confusion or inconvenience. This error will be correct and an updated map will be posted on the website." The above email from the Davis Lake homeowners association landed in the inbox of aShortChronicle long before this blog even existed. It was back in September 2007. Yours truly lived in Davis Lake when the tragic event described occurred. Sadly, for those who lived in the vicinity of this accident, it was widely known that it was just a matter of time before this type of email had to be sent. That left turn was dangerous. 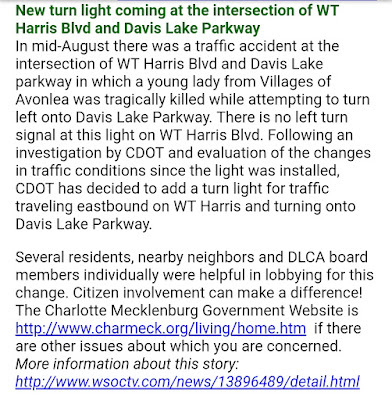 As readers probably know, Harris Blvd in North Charlotte is a divided highway with two lanes in each direction. Traffic regularly moves through that particular area at high speeds. Making a left across two lanes of fast moving traffic is not for the faint of heart. It was an accident waiting to happen. Residents had been asking for a left turn signal at that light for a long, long time. One showed up almost immediately after someone died, so that improvement - while welcome - was also bittersweet. 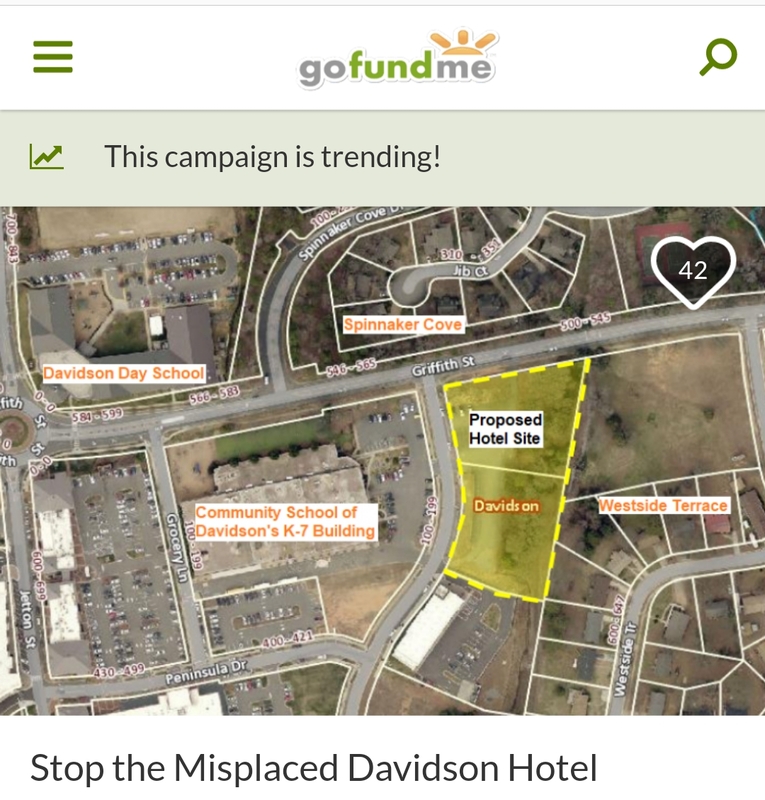 Unfortunately, this incident from 2007 is what immediately came to mind when seeing the proposed idea for a new "superstreet" intersection at Davidson-Concord Road and NC 73 as part of a $160 million project to widen NC73 from Huntersville to Concord. The so called "superstreet" design for this project was unveiled to residents at loval NCDOT presentations in late January. aShortChronicle passed along that press release here. Comments can be submitted on the plan through this coming Tuesday per that release. While the superstreet design is billed as a supposedly safer design option, it is hard to see how that is the case at this intersection. Superstreet don't have left turns and minimize stoplights. Below is a picture of what that means if one is implemented at Davidson-Concord Rd and NC73. finally, merge back into eastbound 73. A simple one step process of turning left becomes a convoluted and likely hair raising five step process with that fourth step of doing a u-turn across two lanes of high-speed traffic looking eerily like the left turn in that fatal accident described from 2007 on Harris Blvd. Add to that the fact that during rush hour a significant majority of the traffic approaching that intersection on Davidson-Concord Rd wants to go left, and you have the makings of an accident waiting to happen scenario. That's a scenario that should be avoided at all costs. Not speaking up now let's that decision be made in a vacuum by engineers at the NCDOT - engineers whose primary concern is moving cars and commerce as fast as possible along major roads like NC73. However, they can be convinced to do what is best for the community if the community speaks out loud enough, forcefully enough. Somewhat ironically, the best local example of that convincing also happens to have occurred in recent years along this very same stretch of road. Long-time readers will remember what it took to get the speed limit lowered on Davidson-Concord Rd back in 2016. The effort that finally rammed that issue through began with this blog post containing videos of how dangerous that situation had become. 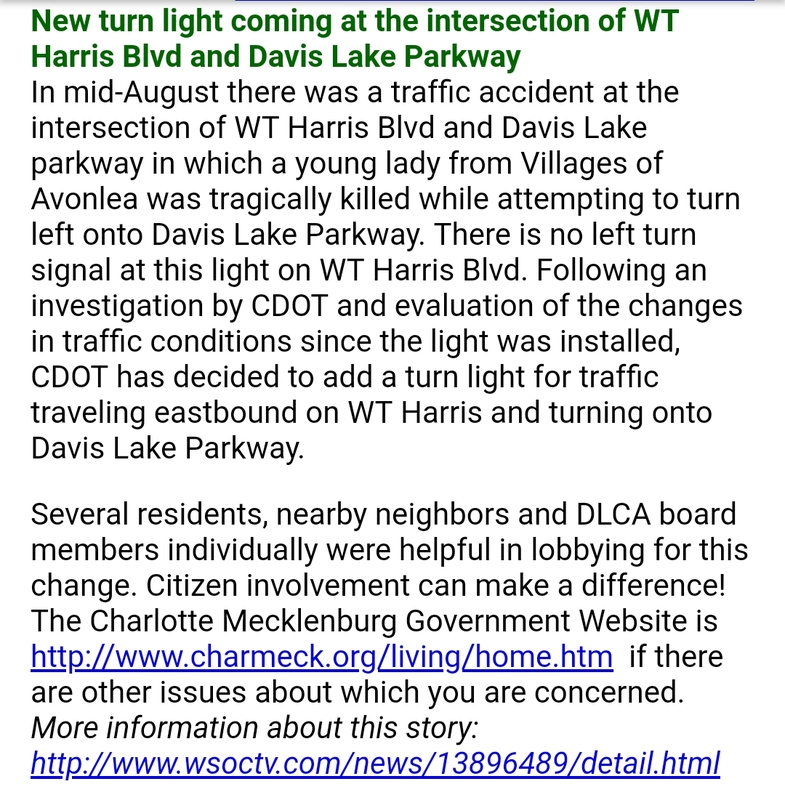 It came after Davidson Town Hall had all but given up on the idea, but in the end NCDOT did the right thing and listened to what the public wanted because the public was adamant. There are no videos of how dangerous this intersection is right now. Right now the intersection of Davidson-Concord Rd and NC73 is not really dangerous. It is just slow. Engineers should focus on solving that problem, but the solution shouldn't come at the expense of making drivers take unnecessary risks on a daily basis. If you think crossing four lanes of high speed traffic during rush hour just to make a left is dangerous, then get your comments in now. Email comments to Project Manager Theresa Ellerby at tellerby@ncdot.gov. Comments can also be submitted by phone at 919-707-6020 . The correct type of intersection at this location will hopefully mean videos of close calls and more importantly emails like the one at the beginning of this post never have to be sent to anyone. "The study shows a 20 percent overall reduction in travel time compared to similar intersections that use conventional traffic designs," says Dr. Joe Hummer, professor of civil, construction and environmental engineering at NC State and one of the researchers who conducted the study. "We also found that superstreet intersections experience an average of 46 percent fewer reported automobile collisions – and 63 percent fewer collisions that result in personal injury." Reduced travel time for who? And what are the volume of left turning traffic in the intersections studied? No doubt, the through traffic on 73 would be faster with the reduction in signals. However the link says nothing about travel time for people turning left off the side street when that side street is a high-volume thoroughfare itself and the vast majority of the traffic wants to turn left. That will be the situation at Davidson Concord Rd. AS for the accident data it clearly says in the link that the accident data was collected at non-signalled intersections. "The superstreet collision data were collected from 13 superstreets located across North Carolina, none of which have traffic signals." AS such the accident data is not relevant to the Davidson Concord Rd intersection. You also left this part out. "The superstreet concept has been around for over 20 years, but little research had been done to assess its effectiveness under real-world conditions. The NC State study is the largest analysis ever performed of the impact of superstreets in real traffic conditions." I'd like to see a study that assessed the real world conditions we will be living with here before experimenting with the safety of locals.